Four of the index's pollutant components (i.e., carbon monoxide, ozone, nitrogen dioxide and sulfur dioxide) are reported in ppmv but PM10 particulate matter is reported in μg/m3. Right now its less than 150 for KL.. But unless it rains, the levels are going up. Caution: People are coming up with these anti-virus air purifiers.. These will do nothing to affect the suphur or carbon oxides.. Best way is to steam your room, and then use air-conditioner to condense it back.. The steam will absorb much of the gases present. We will be using a tool called PowerTrace. This tool is believed to be 94% accurate to determine the power consumption for many functions such as during cpu usage, radio transmission, radio listening etc. To include the functionality of PowerTrace in your code. Simply add the following line after "PROCESS_BEGIN()" for your code. After running the simulation, it generate a lot of powertrace data on the mote output window (roughly every two seconds) outputting a wide variety of number as shown. str, clock_time(), P ( rimeaddr_node_addr.u8, rimeaddr_node_addr.u8 ), seqno, all_cpu, all_lpm, all_transmit, all_listen, all_idle_transmit, all_idle_listen, cpu, lpm, transmit, listen, idle_transmit, idle_listen, followed by some mathematical numbers.. Check Line 116 here for other details. If everything goes well, a nice looking graph should come up. Part 1 in this series can be found here. //And then send it to process_2..
(*(int*)) is necesaary to convert 'data' into a proper integer. if we dont include the *(int*) thing first. As can be seen I didnt use any while() loop. I want to focus on power consumption on this post before I go into the details for networking. It is important to know how your algorithm does on the power consumption side. Contiki has a software-based power-profiler which can be used for this. Few lines of code have to be added in your program to enable that. But there is also another way. We will be using MSPSim's power-profiler. We will be using the Sky Mote Type for this. I used this code for generating a "Multiplication Table of 5" in the Sky Mote for this example. Right Click on the Mote in the 'Network' window and then 'Mote Tools' & 'Msp CLI'. A Msp CLI dialog box should open. The first column is the percentage of CPU activity. 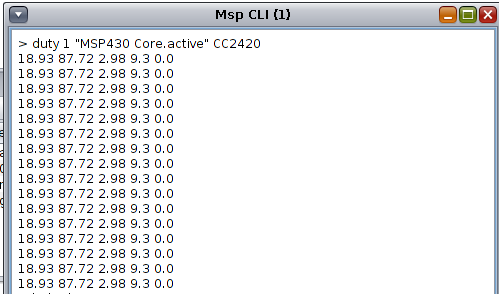 This is generated because of the "MSP430 Core.active" argument. The second column is the percentage of time for radio power down. The fourth column is the percentage of time for radio transmit. The fifth column is always 0.0 no matter what code I run, so I dont know what that does. Notice the last 4 should add up to 100. It shows the CPU is active 18.93% of the time. Radio is off 87.72% of the time. Radio shows 0.0 (always; even with a bit of reception). So how to calculate the power consumption?? Multiply the total simulation time with the % above to get total time for a certain activity. Then multiply with the standard power consumption which can be obtained from some data sheet. I dont know why they divide specifically by 4096..They describe it as each second containing 4096 ticks of cycles only. I am still uneducated why, as a Tmote Sky is not 4KHz speed device. May they are just referring to the CC2420 radio. Sigh! Only if things were nicely documented. Not everyone understands English in the same way. 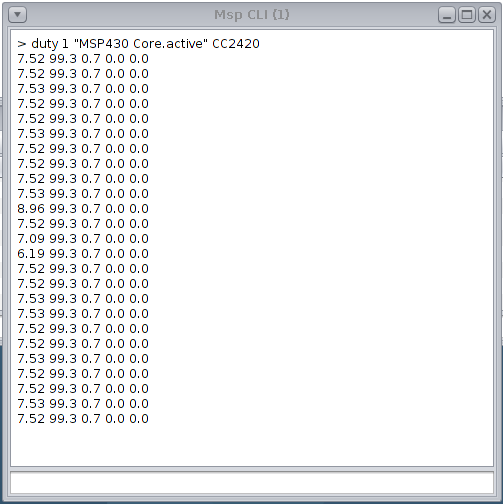 Let see how to use a timer to display a multiplication table of 5 on the serial port. 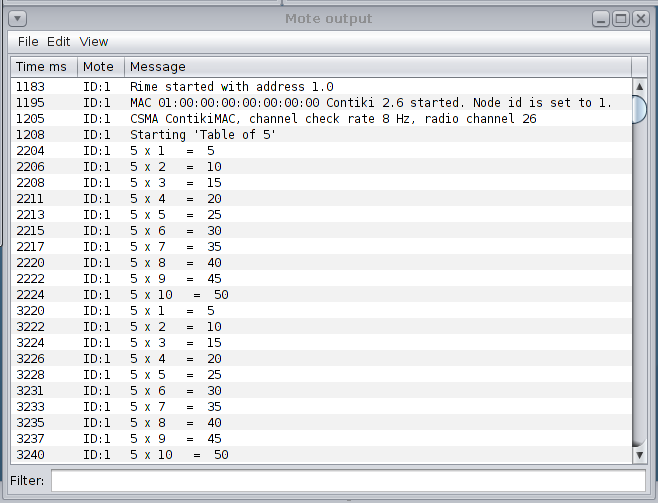 Now we have got our 'Hello World' process running nicely on a mote. Now we are ready to make things more interesting. Let's now focus on the stuff that comes between PROCESS_BEGIN() and PROCESS_END(). Presented next is a modified snippet of the source code I took from this website. This is another example of a 'Hello World' process, but it introduces some new concepts related to process blocking and then unblocking via a timer (I am trying to reduce the technical jargon so do excuse me if it may not sound correct). the process will runs again and again. This will reset the timer. An alternative way to reset the timer is just include the initialisation of the timer variable inside the while() loop. This way we dont have to worry about putting etimer_reset(&timer) at the end of the code. This way the while() loop will take care of both the event listener and the event generator. I hope this makes it easier for the readers. The next question that arises is that can we include additional processes in a file. The answer is Yes! But these processes will be concurrent. This means that they can be executed in parallel. So far so good. But we still haven’t done anything useful. Let's start with a basic hello world being printed. Being printed where? On the serial port. Under Cooja, you can go to Tools> Mote Interface Viewer > (Select your mote) > (In the drop menu) Serial Port. You can also see it in the 'Mote Output' dialog box. See you later in Part 4. Now that I have understood the concept of threads, I will move on to something called ProtoThreads. Here is the basic code. This portion lets the protothread wait for events indefinitely. stack that may use large parts of the available memory. do not require their own stack. Each protothread takes two bytes of memory. One thing to be careful is to limit use of local variables here. And do not use SWITCH() statement ever. I dont know (yet) the working of the internals of Contiki, but I got the code working (compiling incorrectly but still ). And it worked.. I need to research more why this happens, or if there is a suitable function for protoThreads that can be used to replace, or if I am just missing something in the big picture. Will update it here once I find out. During my undergrad I took a course on Operating Systems. It was pretty fascinating to know how operating systems have developed over time and how they worked. Nevertheless, I didn't find much to try to devote to this subject. I was a computer engineering major not in ICT, so my subjects varied all the way from VLSI design to Multimedia technology. But now I have this great opportunity to learn. For someone with limited programming experience learning to adapt to programming at this level is not easy. Here I will try to post whatever I am learning for comments, and future notes. Hope I get this all correct. I wont be using advanced technical jargon here, but just enough to make some sense. I will try to keep the description as layman as possible. Let me start with the basic structure of any code. This code will be run on any individual node, and will have to be downloaded (installed/ported) to a node. This can be done in a simulation and then on a proper hardware device. The easiest way to get started is to download Instant Contiki and run it as a virtual machine. I used Oracle's Virtual Box myself for the virtualisation. //Always try to put any code after this. //Can initialise stuff using static keyword. //Will tell you why in the next block of comments. This is something called as a blocking macro. and process enters a blocked state. that’s why we are supposed to define them as static. //End the process. Notice no arguments. 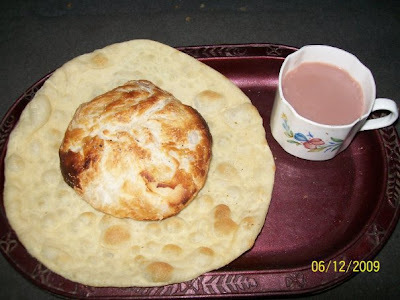 make: *** No rule to make target `basicTemplate_Threads.z1'. Stop. 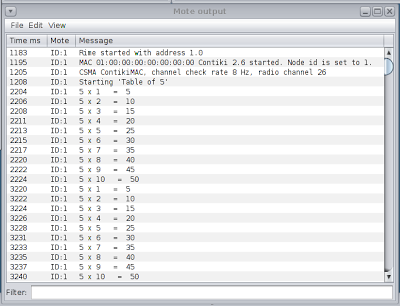 Home/contiki-2.6/examples/z1 and then use that to compile on your simulated z1 mote. For other mote types, just copy to the corresponding folders. This is the easiest way to get it working.